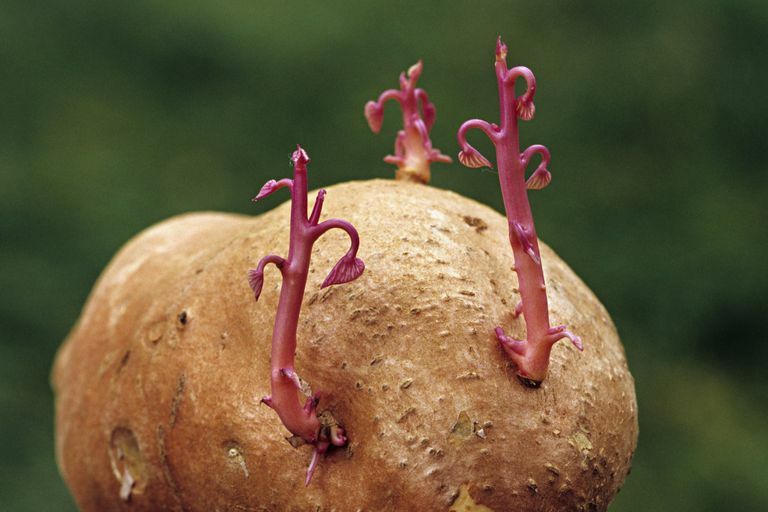 What are the Types of Vegetative Propagation? Home › Category: Biology › What are the Types of Vegetative Propagation? Vegetative propagation or vegetative reproduction is the growth and development of a plant by asexual means. This development occurs as a result of fragmentation and regeneration of a plant part or by growth from specialized vegetative plant parts. Many plants that reproduce asexually are also capable of sexual propagation. Vegetative propagation involves reproduction through vegetative (non-sexual) plant structures, whereas sexual propagation is accomplished through gamete production and fertilization. In non-vascular plants, such as mosses and liverworts, vegetative reproductive structures include gemmae and spores. In vascular plants, vegetative reproductive plant parts include roots, stems, and leaves. Corms are enlarged, bulb-like underground stems. These vegetative structures store nutrients in fleshy, solid stem tissue and are typically surrounded externally by papery scale-like leaves. Due to their external appearance, corms are commonly confused with bulbs. The major difference is that corms consist internally of solid tissue, while bulbs consist of layers of scale-like leaves. Corms produce adventitious roots and possess buds that develop into new plant shoots. Plants that develop from corms include crocus, gladiolus, and taro. Suckers or root sprouts are plant shoots that arise from buds on underground roots or stems. Suckers may also sprout from buds near the base of the parent plant and can grow into new plants. A number of shrubs and trees propagate through sucker production. Some examples include apple trees, cherry trees, banana trees, hazel shrubs, roses, raspberries and gooseberries. Plantlets are vegetative structures that develop on some plant leaves. These minature, young plants arise from meristem tissue located along leaf margins. Upon maturity, plantlets develop roots and drop from leaves. They take root in the soil forming new plants. An example of a plant that propagates in this manner is Kalanchoe or mother of thousand plant. Plantlets may also develop from the runners of certain plants such as spider plants. Cutting – A part of a plant, typically a stem or leaf, is cut off and planted. Adventitious roots develop from the cuttings and a new plant eventually forms. Cuttings are sometimes treated with hormones before being planted to induce root development. Grafting – In grafting, a desired cutting or scion is attached to the stem of another plant that remains rooted in the ground. Eventually, the tissue systems of the cutting become grafted into or integrated with the tissue systems of the base plant. Layering – This method involves bending plant branches or stems so that they touch the ground. The portions of branches or stems in contact with the ground are then covered with soil. Adventitious roots develop in the parts covered by soil and the attached shoot (branch or stem) with new roots in known as a layer. This type of layering also occurs naturally. In another technique called air layering, branches are scraped and covered with plastic to reduce moisture loss. Adventitious roots develop where the branches were scrapped and the branches are removed from the tree and planted. The branches develop into new plants over time. Suckering – Suckers are allowed to grow forming a dense compact mat that is attached to the parent plant. Since too many suckers can lead to a smaller crop size, excess numbers are pruned. Mature suckers are cut away from the parent plant and transplanted to a new area where they grow into new plants. Tissue Culture – This technique involves the culturing of plant cells that may be taken from different parts of a parent plant. The tissue is placed in a sterilized container and nurtured in a special medium until a mass of cells known as a callus is formed. The callus is then cultured in a hormone-ladened medium and eventually develops into plantlets. Plantlets can then be planted and develop into fully grown plants.